After exploring Cardiff on foot I was thrilled to hop in a car to enjoy a two day long rural romp of the Welsh countryside. The capital of Wales offers all of the trappings of a world class city (posh hotels, top notch museum, ancient castle, swoon-worthy shopping arcades and creme de la creme dining) and acts as a perfect launching point for those keen to get up close and personal with the rolling hills and picturesque villages that can only be enjoyed whilst roaming on the road. Planning for an epic road trip takes thoughtful planning and research to ensure you map out a timely route that allows you to visit the regions most famous attractions as well as hidden gems and new businesses that might have recently popped open. This Spring I spent an entire day reading through the Rough Guide to Wales while sipping tea and nibbling on a muffin fresh out of the oven. I scrawled several pages of notes which included recommendations for top hotels, award winning restaurants, star attractions and interesting factoids on the country’s unique history. This updated new edition of Rough Guide to Wales features three suggested itineraries for the ultimate road trip (dubbed The Grand Tour, Historic Buildings and Active Wales). I suggest using a well researched suggested itinerary as the backbone for your road trip and then after researching each region in more detail you can curtail your vacation so that it fills with the tricks and treats you fancy. 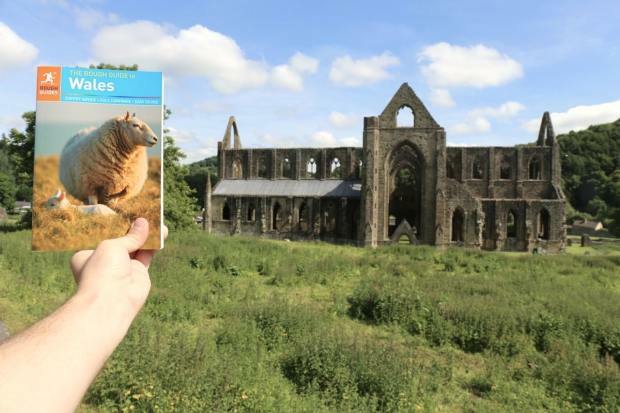 Six miles north of Chepstow, the roofless ruins of Tintern Abbey are spectacularly sited on one of the most scenic stretches of the River Wye. The abbey and its valley have inspired writers and painters ever since the Reverend William Gilpin published a book in 1782 extolling their picturesque qualities. The abbey lasted as a monastic settlement from its foundation by the Cistercian order in 1131 until its dissolution in 1536, and the original order of monks was brought wholesale from Normandy, its members establishing themselves as major local landholders and agriculturalists. The best way to appreciate the scale and splendour of the abbey ruins is by walking along the opposite bank of the Wye. Just upstream from the abbey, a bridge crosses the river, from where a path climbs a wooded hillside. Views along the way and from the top are magnificent! If you’re looking to spend a night sleeping at a posh palace in the middle of a dreamy Welsh rural landscape be sure to book a sweet suite at Llangoed Hall located just outside of Brecon. The properties history reads like a whimsical fairy tale: believed to have been the legendary White Palace, home of the first Welsh parliament. A mansion existed from 1632. It was first in the possession of the MacNamara family having been won in a card game and it stayed with them for two generations until 1847. In 1912 Clough Williams Ellis re-designed the mansion as a country house. Sir Bernard Ashley bought Llangoed Hall in 1987 and opened it as a hotel in 1990. Every one of Llangoed Hall’s 23 bedrooms have been individually designed and possesses its own unique character and charm. The rooms are furnished with intriguing antiques, and original works of art. Every moment of my stay was a special one, from my stroll through the backyard garden and kitchen’s farm (do be sure to say hello to the flock of cooing hens) to indulging in a few drops from the complimentary crystal decanter of sherry which I enjoyed sipping from my decadent mid-day bubble bath. 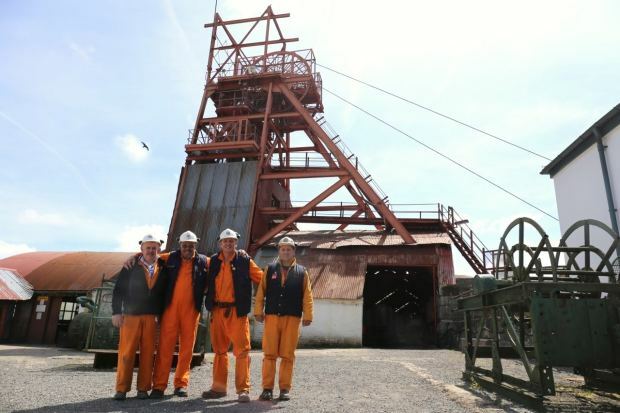 Less than a mile west of the charming town of Blaenafon lies the marvellous Big Pit National Coal Museum, occupying a former colliery which opened in 1880 and closed exactly a century later. Of all the mining museums in Wales, Big Pit brings you the closest to the experience of a miner’s work and life, as you descend 300ft, kitted out with lamp, helmet and heavy battery pack into a labyrinth of shafts and coal faces. The guides are all ex-miners, who give you personal insight into mining life as they lead you through examples of the different types of coal mining. After emerging from the Big Pit take a short drive into town for a visit and tasting at Blaenafon Cheddar Company. The petite shop is run by a local family who currently produce fifteen distinctive cheddars and four varieties of goat’s cheese. All cheeses are hand made in the shop on Broad Street. The most storied of their cheeses is the Pwll Mawr (Big Pit) cheddar which is actually matured at the bottom of the mine shaft at Big Pit mining museum and can also be bought at their gift shop. Other cheeses are flavoured with a heart for top notch local products such as Penderyn Welsh whisky, Welsh white wine and Reverened James ale. Rising from the valley floor 12 miles south of Talgarth, the solid round tower of the castle and court at Tretower was built to guard the valley pass. Having replaced an earlier Norman fortification, the high, circular 13th century tower is pretty much all that remains of the castle building, alongside a few sections of wall adjoining a farm. More impressive is the late 14th century manor house, whose downstairs rooms contain a mock-up kitchen, pantry and buttery. The quaint town of Hay-on-Wye, at the northern tip of the Brecon Beacons, is synonymous with secondhand books. Since the first bookshop opened here in the 1960s, just about every spare inch of space has been given over to the trade, including the old cinema, houses, shops and even the crumbling stone castle. There are now well over thirty bookshops in town, many of which are highly specialized, including one dedicated soley to travel, poetry, children and even “murder and mayhem.” Just off the top of Castle Street, and the largest bookshop in Hay (and perhaps the world), is Richard Booth’s Bookshop (pictured). 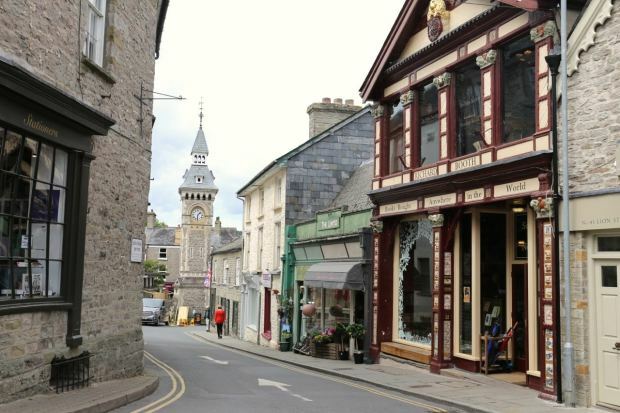 Set in Hay’s second-oldest building (after the castle), the ancient stonework, outdoor terrace and crackling open fires make for an atmospheric stop to satiate after browsing through the town’s best books. I was keen to sample the country’s most iconic pub grub, Welsh Rarebit and after popping into several establishments in town found the classic cheese sauce slathered toast on offer. The Welsh Rarebit at the Three Tuns is served with hereford hop and apple coriander salad. 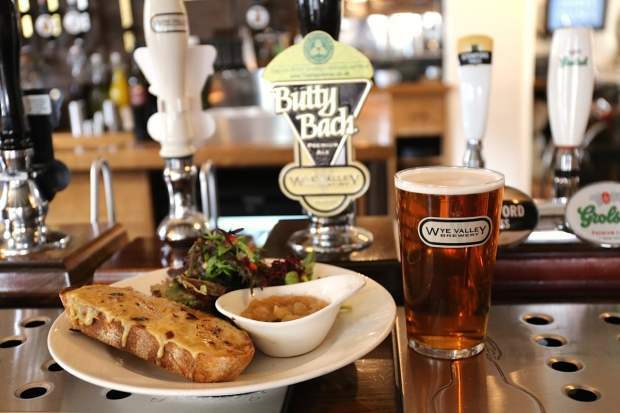 Be sure to pare with a pint of local Butty Bach Ale from Wye Valley Brewery. Below Pontsticill, the tiny Brecon Mountain Railway shuttles passengers along a scenic two-mile section of track on the eastern bank of the reservoir down to Pant station. Guests travel in vintage coaches via steam locomotive into the Brecon Beacons National Park. Today’s popular tourist attraction was conceived over 40 years ago when a search started to find a suitable site to build and operate a steam railway using locomotives collected from around the world. Perfect way to spend the afternoon choo-chooing! When the Welsh Whisky Distillery opened in 2000, the small town of Penderyn became Wales’ first working distillery for more than one hundred years, and today it produces three single malt whiskies, matured in bourbon barrels and finished in Madeira wine casks. Hour-long guided tours of the centre take in an exhibition on the working of the distillery and an explanation of the distillation and bottling process. The team here also produce top notch gin, vodka and Merlyn Welsh Cream Liqueur which will offer Bailey’s fans a new favourite sweet sipper. The Wye Valley Area of Outstanding Natural Beauty (AONB) is an internationally important protected landscape area straddling the historic border between Wales and England. It is renowned as one of the most dramatic and scenic landscape areas in southern Britain. Road trippers (like me) will find it hard not to quickly fall in love with the rolling green hills dotted with endless herds of sheep. Today the population of Wales clocks in at 3 million people but one really finds wow in statistics when they realize rural Wales plays home to over 14 million sheep! If you’re traveling through in the Spring you’ll have the opportunity to say hello to adorable newborn lambs. 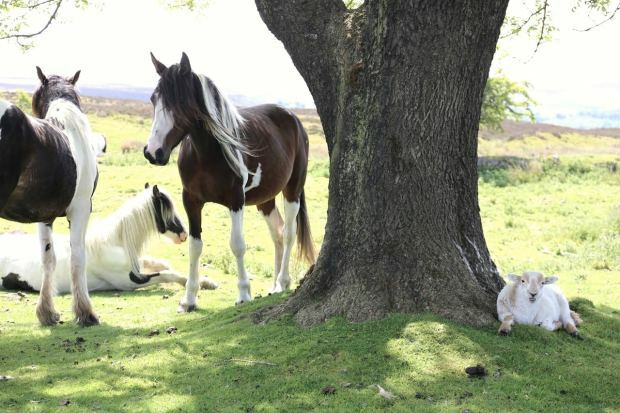 If you’re really lucky you might have the opportunity to catch a glimpse of the Wye Valley’s famed wild horses which during the Industrial Revolution were raised to help hustle iron and coal to and fro.